The United States Army Airborne School focuses on paratrooper training for the United States armed forces. 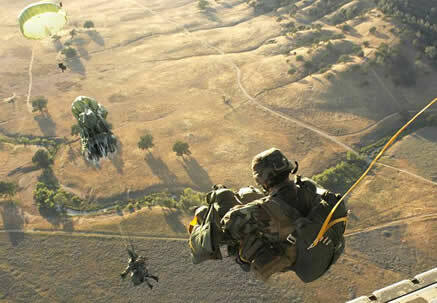 Paratroopers are soldiers and marines that use parachutes in operations and campaigns as part of an airborne drop force. The school itself is operated by the 1st Battalion, 507th Parachute Infantry Regiment based out of Fort Benning Georgia. The school, also called “Jump School” provides the armed services with a Basic Airborne Course. Jumpmasters also provide training to other select groups within the Department of Defense as well as United States allies, though the latter is in rare circumstances and often involves training for jumping with cargo for aid related missions. Jump School certifies its students in the use of parachutes for combat situations. It is reported to be one of the toughest specialized training schools used by the Army and has bred a culture of aggression in training. The school is completely voluntary and most soldiers who attend have it added to their contract with the armed forces, though it typically adds one year to their deployment because of the specialized nature of the training. Students may quit at any time during the three-week course, whether they are still working on the ground or are in a plane about to make a jump. Most students in the Airborne School at any given time will be from the Army. The Army operates four large airborne divisions and its special operations and Special Forces are also required to partake in parachute training. Marines also attend Jump School alongside Navy Special Forces. The Air Force sends some of its para-rescue trainees, weather technicians, and tactical air control members through the training. The Coast Guard does not send recruits to Jump School. Instructors are known as “Black Hats” because of the black baseball caps that are part of their training uniforms. The caps are emblazoned with their rank and the parachutist bade. Black Hats hold the rank of Sergeant and are referred to as “Sergeant Airborne.” However, if the instructor is from the Navy they are a Petty Officer in rank because the Navy uses a different officer classification system. Instructors can come from any of the four military branches that attend the school, but are typically from the Army. The first week of Jump School is all on the ground. Soldiers and marines learn how to safely land when they hit the ground by absorbing the impact with their entire body instead of landing solidly on the legs, which can break ankles and knees. The proper landing technique for paratroopers is called the Parachute Landing Fall (PLF) and involves landing on the sides of the lower legs and knees while rotating to send energy through them as well as the upper body – always land with your knees together! The technique compensates for the rate of falling that the T-10D parachute creates, roughly equivalent to fall from a height of 1.5 stories. Training involves running and performing maneuvers with the parachute and other equipment at first. Once soldiers are used to the feel of the gear, they begin jumping off of objects with it. Soldiers jump into pits of sand and other semi-hard cushions. Black Hat instructors are on-hand to correct technique, especially a soldier’s posture, and show soldiers how to apply this falling to movement as they fall. In order to pass Ground Week and move on to Tower Week, soldiers must pass all of the jumps as well as standard Army Physical Fitness Test requirements. If a soldier does not leave the program but does not pass, they may have an option of receiving a second round of training in order to attempt to pass the tests again. This often happens for soldiers who are injured during the training. The Army keeps these greenhorns extra green by calling the practice recycling. If you pass, it’s on to jumping and falling from much greater heights. Tower Week involves jumping, falling and being pushed from various towers that range between 36 feet tall and 250 feet tall. Soldiers use the smaller towers to learn how to properly land and are required to maintain proper technique throughout the entire fall. For smaller towers, soldiers are attached to a zip line that includes a brief dead drop. Soldiers jump from the tower with a slackened line that does not catch until after a free-fall of about 8 feet. The line will jerk and then the solider slides properly. Again, technique must be kept perfect through the process because this teaches soldiers how to handle the whiplash and catch associated with first opening a parachute. You can’t close your eyes during these falls or you’ll have to do it again. This often means that soldiers who report enjoying the whole process only have to do these falls once or twice while those scared or uncomfortable with the process repeated it many times. Small and medium-sized towers are used to teach soldiers how to properly exit an aircraft, from jump positions and lines to techniques for avoiding aircraft parts and forces. Tower Week culminates with the 250-foot tower. Soldiers are strapped into a harness and lifted into the air at the top of tower. Their parachutes are opened and they are left to drift down from the tower. Soldiers will perform these drops with the standard T-10D parachute and may also learn to use the T-10C, which allows for some steering. Soldiers are trained to aim for specific points of impact and the final tests involve hitting the center of a drop target. Tower Week also teaches soldiers how to use different parachute equipment including emergency and reserve chutes. This includes required classroom lessons. Sleeping at any point during such a class calls for an immediate expulsion from the program. Soldiers that successfully hit jump targets and demonstrate the ability to operate emergency equipment under pressure are passed on to Jump Week. Soldiers get thrown out of a perfectly good airplane during Jump Week. Paratroopers are usually put in a C-130 or C-17 and flown from Lawson Army Airfield to Fryar Field where all of their training jumps are made. This has earned the area the nickname “Fryar Drop Zone.” Fryar is named for a World War II soldiers who was part of the parachute corps and won a Medal of Honor. Drops are typically made from 1200 feet by a plane circling the drop zone. Soldiers are made to check their equipment, connect to a line inside the plane, and jump out of the airplane when told to by their Black Hat. The plane uses green lights to indicate that it is in the drop zone. If there are still soldiers onboard when the light turns red, the plane circles back around to the drop zone and then they jump. 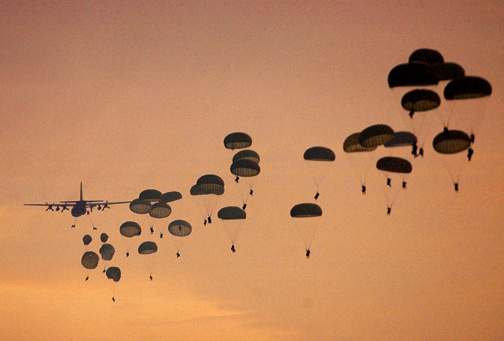 Airborne School graduates need to have at least 5 successful jumps, including one night jump. Soldiers jump with a variety of different equipment levels, from virtually nothing to a full combat load. After a jump, soldiers collect their gear and return to Lawson to await their next jump. Thursday is the final day for jumps during a typical Jump Week and the graduation ceremony is held on Friday morning. In the case of bad weather or large groups, however, the graduation ceremony can be held at the Fryar jump site immediately after the last jump is finished. While family and guests are able to watch jumps and see their soldiers at graduation day, interaction is limited. For most, Jump School is part of a continuous training program so there is no leave or celebration built in to the school. Jump School was first instituted in 1940 when the War Department developed a paratrooper platoon. It was made up of Fort Benning’s 29th Infantry Regiment. The first trainees went to New Jersey to use existing towers and gear left over from the New York World’s Fair. This allowed them to perform jumps in situations close to an airplane jump but with more safety options. The towers initially used served as models for the towers currently in use. In 45 days after formation, students made their first jumps from a B-18. They landed in Lawson Field on August 16, 1940. This platoon holds the honor of being the first to have a mass jump in the United States. First Lieutenant William Ryder and Private William King became the first officer and enlisted man to officially jump as paratroopers in United States Army history. The school currently allows some units and individuals to serve as guest jumpers. These guests are not allowed to jump during the students’ first jump. The school has limited space but allows members on pay loss or hurt status to jump in order to regain some pay or improve their station within ranks. Typically, soldiers need hazardous duty orders to be guest jumpers. Soldiers with jump experience that are assigned to Ft. Benning can also get jump status permission but this is limited. The operation has a strict “no walk on” policy. Thank you for this write-up. Very informative. Will aide me in my decision to attend or not. I went to Jump School in Jan 1966 and lost my cert. How do I get a new one? I want to be a student within your institution but I am a Liberian living in Liberia and seeking a scholarship with your institution to becoming a american solider.